The whole purpose of starting a supper club at my office was to introduce people to different cuisines they normally wouldn't try on their own. Our first supper club involved a screening of “Jiro Dreams of Sushi” at the IFC Theater and then dinner at Bohemian, a Japanese restaurant with a speakeasy vibe. It was here that some coworkers, clad in JCrew button downs and Bonobos khakis, had uni and various sashimi for the first time. On a Scale of Adventure, with 1 being someone substituting sriracha for ketchup on their burger and 10 being someone who eats live octopus and bahay itlog (chicken ovaries on skewers), most of the group would be around a 6 with a few 2’s sprinkled in. Pok Pok showcases Andy Ricker’s northern thai cuisine - bold spices, fermented fish sauces, and sweet and sour notes that invade your sense of smell well before reaching your mouth. In other words, we selected this place to push us as a group to try something unique and to get us out of our comfort zone. We took an Uber SUV since it wasn’t the easiest to get to via subway. After a short ride, we arrived in the Cobble Hill neighborhood. It was early February 2013 and frigid drops of rain drizzled on us as we made our way to the back room. Our eyes adjusted to the bright yellow hue and our noses adjusted to the smell of spices. Tables with red and white checkerboard tablecloths lined up against the bamboo walls. We immediately felt transported out of New York and into a local’s grass hut. We took our seats and ordered a round of blood orange negronis and perused the menu. The first dish to come out was Kai Yaang - charcoal roasted label rouge hen stuffed with lemongrass, garlic, pepper and cilantro. Served with spicy sweet and sour and tamarind dipping sauces. Unfortunately, it was kind of dry and the bone to meat ratio was too high. Boxes of scented sticky rice appeared on our table to balance out the flavors for upcoming dishes such as the Het Paa Naam Tok - spicy forest mushroom salad with soy sauce, lime and chili powder dressing, shallots, lemongrass, mint, cilantro and toasted rice powder. As a mushroom lover, this was second favorite dish. Complex flavors that hit you right out of the gate. The third dish was a chinese broccoli with a sauce that packed more punch than your traditional oyster sauce. 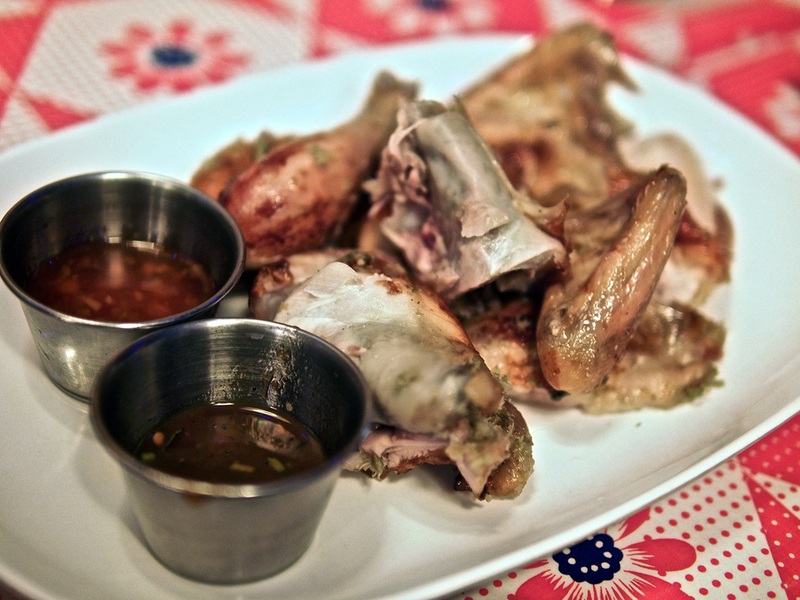 The renowned Pok Pok wings was the main draw and written up in every blog and magazine. MY anticipation increased when the plate of wings were brought out, the fish sauce permeating the table. To be honest, the marinade was perfect - sweet and a slow burn from the chili paste but I still prefer Korean fried chicken due to the crispier skin. Maybe we received a bad batch but I thought it was slightly overhyped. My feelings of disappointment were erased immediately when I took a bite of the Papaya Pok Pok - spicy green papaya salad with tomatoes, green beans, thai chili, lime juice, tamarind, fish sauce, garlic, palm sugar, dried shrimp and peanut made to order in the “pok pok” (mortar and pestle). Be careful not to take a big bite - the thai chilies pack a punch and I went through 4 napkins and 3 spoonfuls of soothing sticky rice after my first bite. This dish embodies the philsophy of Pok Pok. You want an authentic taste of northern thai? A must order. After that vegetable dish, it was time for a heavier meat dish which came in the form of Muu Kham Waan - niman ranch pork neck rubbed with garlic, coriander root and black pepper, glazed with soy and sugar, grilled over charcoal and served with a spicy chili/lime/garlic sauce.. Love the smoky sweet flavor and the pork neck was juicy and tender. Accompanying the pork neck was a plate of chilled mustard greens as a refreshing palate cleanser. Act II began with Hot Thawt - crispy broken crepe with steamed fresh pei mussels, eggs, garlic chives and bean sprouts, served with shark sriracha sauce. Thai street vendor's specialty popular in night markets. Best part of the dish was how perfectly crisp the bean sprouts were. Would order again. One of my favorites was Kaeng Hung Leh - northern thai sweet pork belly and pork shoulder curry with ginger, palm sugar, turmeric, tamarind, burmese curry powder and pickled garlic. It was heavy, stick-to-your-ribs and the broth was perfect over jasmine rice. Must order. After many pork dishes, we needed a solid fish dish and the Cha Ca "La Vong" didn’t disappoint. Hidden under a canopy of green onions were chunks of vietnamese catfish marinated in turmeric and sour sticky rice, fried in turmeric oil with scallions and dill, and served on rice vermicelli with peanuts, mint, cilantro. Can't praise this dish enough. The catfish was so juicy and the sweet glaze on it went perfectly with the greens. Plus the noodles at the bottom were cold, slimy, and delicious. Act II was going very well but there were two speedbumps with the first being the Sii Khrong Muu Yaang - Niman Ranch baby back ribs marinated in whisky, soy, honey, ginger and thai spices that were slow roasted and served with 2 spicy dipping sauces. Would skip this since it’s similar to ribs you can get at any asian restaurant. The meat was also a little too lean for my tastes. Another mediocre dish was the Sai Us Samun Phrai - chiang mai sausage with herbs, aromatics and burmese curry powder. Charcoal grilled and served with naam phrik num spicy green chile dip, khaep muu, thai pork rinds and steamed crudites. The sausage had great flavor but was a little dry. Pork rinds were slightly stale. Not mind-blowing compared to the past dishes. I'd skip it and use the money towards something more worthy such as my top favorite dish from the evening: Da Chom's Laap Meuang. The story goes that Andy learned the dish from his father’s friend, Da Chom who resides in Thailand and still makes laap for his family at the age of 84. The dish is a spicy hand-minced pork salad with aromatics, spices, herbs, cracklings and crispy fried shallots and garlic and served with phak sot. Great balance of flavors, juicy meat, and fried shallots for crunch. For me, it just fired on all cylinders. Act III came in the form of some desserts. The Pok Pok Affogato was a condensed milk ice cream drowned in a shot of black vietnamese coffee, served with a chinese fried donut. Heavenly. The next dessert made us laugh. When we ordered an ice cream sandwich....we didn't expect ice cream. In a sandwich. Bursting at the seams, we struggled to make it through the door and into our car. I rolled down the window and the cool breeze felt so goddamn good on my face. I remember that moment in great detail. My lips - numb from the spices, my hair - damp from sweat, and my cheeks - rubbed raw from at least 50 napkins. What an immersive, exhilarating experience. I felt like I just finished a half marathon - my senses heightened and a big smile on my face. Awesome Supper Club! Perfect venue for a supper club/group dinner. We rolled in with 6 people and it allowed us to try the majority of the menu family-style. I recommend coming with a group of at least 4. Get: Da Chom's Laap Meuang, Kaeng Hung Leh, Cha Ca "La Vong", Het Paa Naam Tok, Papaya salad, Muu Kham Waan. Ask if Andy is there. I met him at a Lucky Peach event last June and he offered colorful stories about his travels, the inspiration behind many of his dishes, and his story on how he started cooking. Really nice and not egotistical like other top chefs. Get lots of sticky rice. Trust me.